This model describes the human cardiovascular dynamics under a displacement pump type ventricular assist device (VAD) support using lumped-parameter modelling, based on the concept of hydraulic-electric analogue. The original model was implemented using C language. Due to the difference of description language and procedural language, some features such as the heart valve dynamics can not be realised effectively, and have to be simplified in the current CellML implementation. 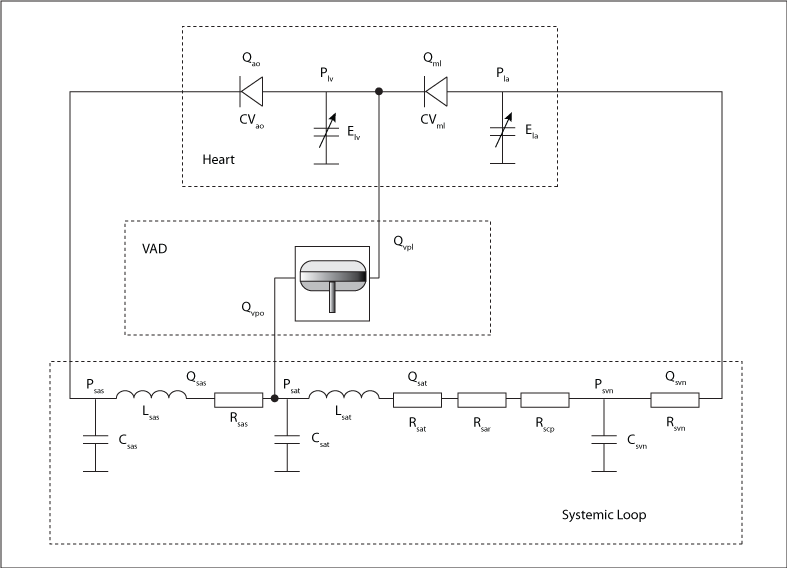 The model comprises three main parts: the heart, the systemic loop, and the displacement pump VAD, as illustrated in Fig. 1. The heart is modelled as a two-chambered pump with variable elastance and two heart valves to control the direction of blood flow. The systemic loop is sub-divided into a number of segments, namely: the aortic sinus, artery, arteriole, capillary and vein segments. In each segment, individual components are modelled by representations of the local resistance to blood flow, vessel elasticity and the inertia of the blood. The displacement pump VAD is described by prescribed pump inlet/outlet flow changes. Numerical simulation of cardiovascular dynamics with different types of VAD assistance, Shi Y, Korakianitis T, Bowles C, 2007. Journal of Biomechanics 40(13), 2919-2933, PubMed ID: 17433816. Derived from workspace Cardiovascular Circulation DVad at changeset 13fe14bd8114.